Our firsts with the free version of Cinemartin MyBD indicate that the software delivers what it promises. Our forum administrator Alan1476 has taken the time to test the software and used it to back up five movies. The initial Blu-ray discs were all over 25 GB in size and were shrunk to a 500MB file with no noticeable loss in quality. The somewhat outdated GUI might not impress you, but the results were good. 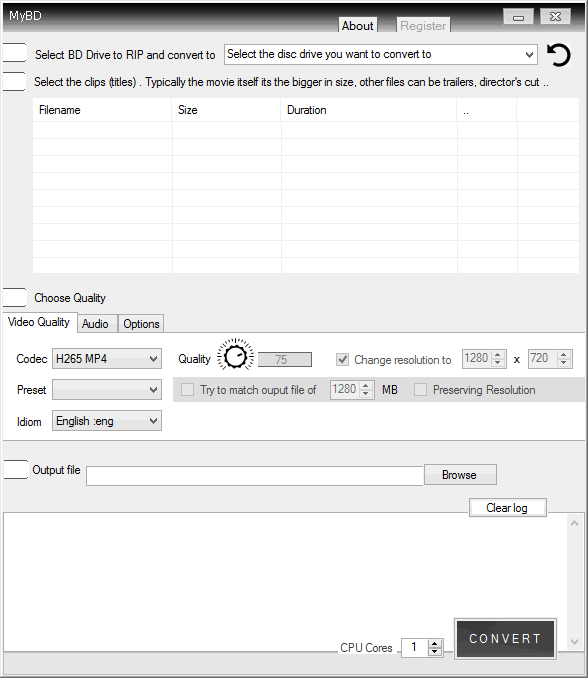 The software takes care of decrypting the Blu-ray disc and then converts it to either MKV or MP4. Alan1476 tried it on the Blu-ray versions of Dirty Harry, Domino, Kill Bill 1 and 2, Weeds Season 1 and Battle Los Angeles. All discs completed within 2 hours with an average completion time of 1 hour and 45 minutes on 2 cores (limit of the free version) of Intel 4770K Haswell CPU . In that time the software decrypted the Blu-ray disc and converted it to a about 500 MB big video file with hardly any loss in quality. We wrote about the software two days ago, the company claimed to be able to shrink a Blu-ray to about 2% of its size without any noticeable loss in quality. As Cinemartin isn’t a well known name in the consumer market many of our readers were skeptical. Along with the user interface and the requirement to give personal details in order to get access to the free version it was received well. However it appears the claims the company is making do appear to be valid. Read the entire experience of alan1476 here, download Cinemartin MyBD here. Cheap secure cloud storage: What are the best cloud storage options in 2019? Apple iCloud security: How safe is your personal data… Really? Google Pay Vs Samsung Pay: Who Should You Trust Your Money With In 2019? © Copyright 1997 – 2019 Myce B.V. – All rights reserved. It is prohibited to use or publish this content without proper authorization. Offenders shall be subject to penalties provided by law. Cruquiuskade 251, 1018 AM Amsterdam, Netherlands.